I’ve got to say though, if you’re a serious or novice eBook reader, take a look at their Adobe Digital Editions. I know that lots of people are uncomfortable with Adobe’s PDF files, probably because they’re all-pervasive and represent a lack of choice that the net is designed to prevent; however, Adobe Digital Editions is the cat’s meow for people who like to read PDF’s on their computer. It offersÂ platform supportÂ for reading digital documents on laptops as well, in addition to allowingÂ support for the SonyÂ® Reader. 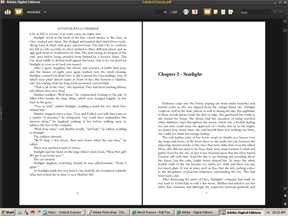 I found it easy to work with, and presented formatted eBooks, documents and magazines beautifully. You can page through eBooks and docs with a real-world feel and look. I do take my hat off to the designers, they’ve done a hell of a job with this. There’s a ‘feel’ to it that somehow resonates with that old-world, Gutenberg part of me that would prefer it if we could just go back to reading regular old-fashioned books. Yah? This program crosses over nicely and depending on your monitor does an excellent job of emulating the color and ‘look’ of a printed page. Perfect for PDF fans, and for newbies who want to try the eBook thing but want to do it one step at a time. There are variable viewing options–single or multipage, zoom–depending on preference and reader eyesight. You’re also able toÂ build your own PDF library from eBooks you can download for free from their collection of samples and public domain works. And you can read any PDF you want. Adobe Digital Editions will open up any PDF documentÂ formatted the way the publisher wanted it. Read the full lowdown on its features here.